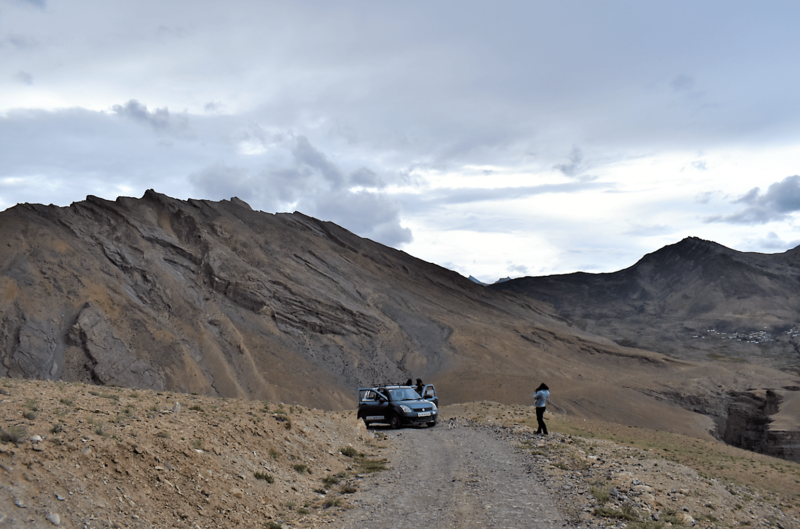 After spending a great day in Key Monastery, I headed towards Kaza to look for vehicles going towards Chandratal. But the local trade festival of Spiti, known as Ladarcha was supposed to begin on this day, and so all the taxi drivers had taken a self proclaimed holiday to enjoy the festivities. By the time we could find a taxi ready to go to Chandratal, it was too late to move ahead, since we would only reach the lake by night, missing out on the real beauty of it. And so, we ditched Chandratal altogether after making multiple failed attempts to reach this Moon Lake! As we were making our way towards a village that only has four houses and is situated right on top of a mountain, the car came to a sudden halt. My friend who was driving told us to be absolutely quiet, and look at where he was pointing. And lo and behold, I couldn’t believe my eyes! 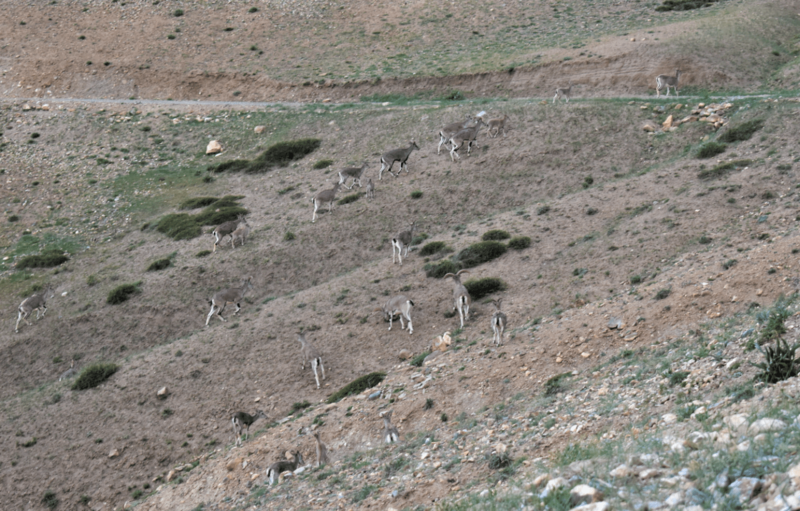 Right in front of me, just a few meters away, was a big herd of the Himalayan Ibex, the famous Spitian deer. A family of about 20-30, they were minding there own business when the sound of frantic camera shutters scared them. We scurried back in the car and chased them for a closer look, for as far as the way allowed us. What a lucky day it was, to spot the Himalayan Ibex on our first ever visit to Spiti, and that too in such a huge herd! The Universe is a crazy place. 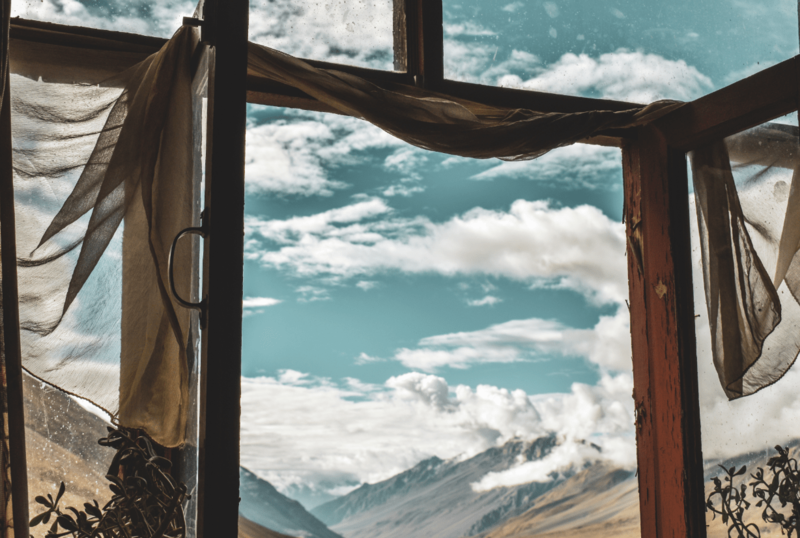 We then resumed our journey and I soon found myself on a rocky terrain with five little white huts visible not too far away, and a riot of Buddhist prayer flags dancing in the wind, right in front of me. 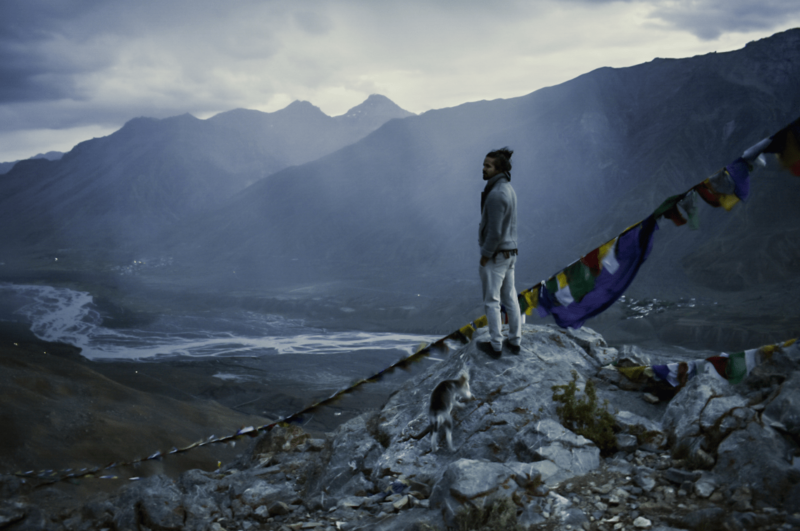 I made my way up right at the edge of the cliff and and as I peaked, I could see the massive Spiti Valley sprawled right in front of me. What I was actually seeing was a bird’s eye view of the valley, with around six Spitian villages visible including Kee, Rangrik, Kyoto and Kaza. The Key Monastery looked so small, I could hardly believe this was the same massive place I had just visited the day before! We were later invited over to a friend’s place called Serkong Homestay in Kibber who also organizes Winter Expeditions and Snow Leopard Expeditions in Spiti. The wonderful hospitality there had my heart. We also tried local homemade barley and apricot seed liquors. These people also took us to Kaza Helipad the next night where we spent hours drinking the local liquor, talking and star gazing. Surrounded with nothing but mountains for miles at a stretch, this is where I felt at home the most. I felt so small and insignificant in that moment, and that’s when I realized why I keep running back to these mighty pieces of Mother Earth at the drop of a hat. Every time I visit them, they teach me something new. I’ve learned that no matter how much money you have, and how many houses and cars you own, everything will soon turn to dust. But what matters is how harmoniously you can live with what’s around you- with other people, and with Mother Nature. Because it is these energies and these relations that you take back to your grave. The essence of being a human does not lie in how much wealth and power you can accumulate over the course of your time here, but lies in the good energies you were able to throw back into the Universe. Congratulations! 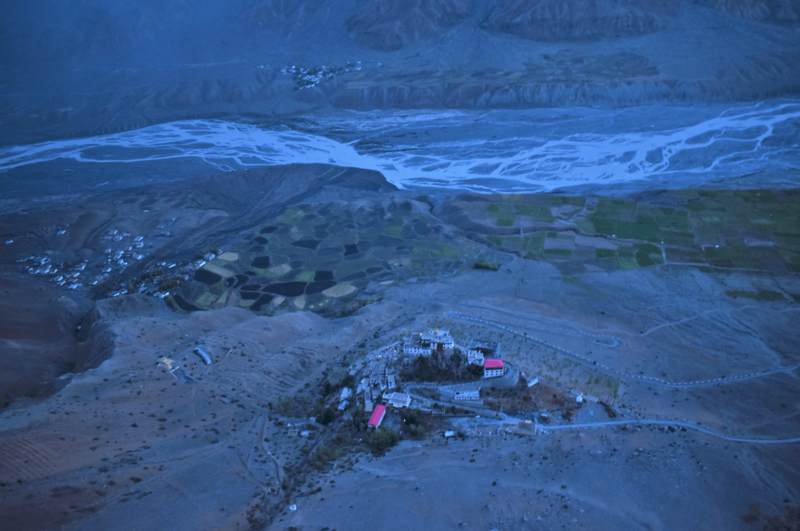 You have completed the third, and final part of my Spiti Valley blogpost series. If you missed out on the previous posts, read the first one here and the second part here. Well written travel memoirs of nature’s lap. 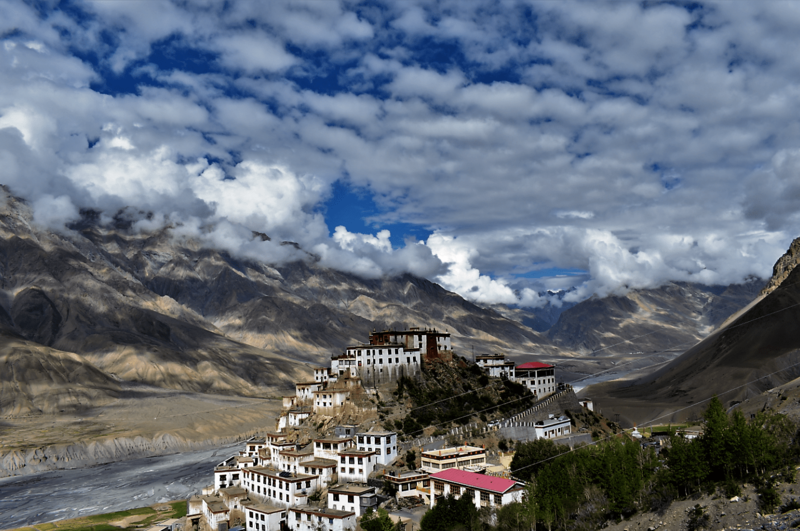 The beautiful geographical landscape of Spiti seems to be yet explored by many travellers…..listed in my to do list.